Heart of the Game, by S. L. Price of Sports Illustrated, is a story about a talented athlete who followed his dream of playing professional baseball until the evening that dream was squelched for good by a foul ball. Price takes readers through the life of veteran minor league baseball player, Mike Coolbaugh, as he pursues his ambition of making a living by playing professional baseball. The story is tragic in so many ways other than its ending. The story of minor league baseball is on display in these pages, and it’s not always hot dogs and apple pie. Coolbaugh, regarded by some veteran scouts of Major League Baseball as a prospect, never could get over the hump of becoming an established Big Leaguer despite years of excelling in the minors as an all-star infielder. After finally succumbing to the realization that he would never enjoy more than the few “cups of coffee” he had in the Majors, Coolbaugh turned to coaching. It was here that a fluke occurrence played out on the diamond: Coolbaugh was struck in the head with a foul ball that killed him instantly. 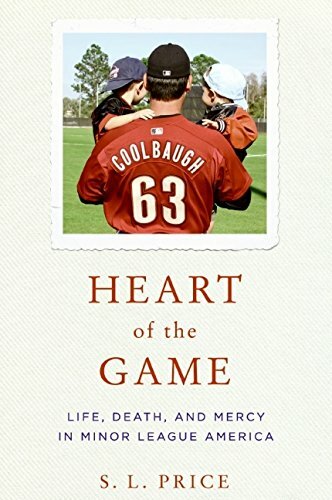 Not only does Price describe scenes of the accident, with his years of experience writing and reporting readers get an inside perspective into what happened, how it happened, and how it ultimately affected everyone from the family of the player himself to the various organizations and players who knew and respected Mike Coolbaugh. Heart of the Game has been lauded by one national sportswriter as the “best baseball book [he] ever read.” Price’s poetic, as well as stoically clear story, about life in baseball’s minor leagues is a sobering tale of both triumph and pain. Where there was hope, there was also a lot of despair, as readers get an insider’s view of how difficult it really is to become one of the lucky few who are fortunate enough to don Major League uniforms and get paid to do so.